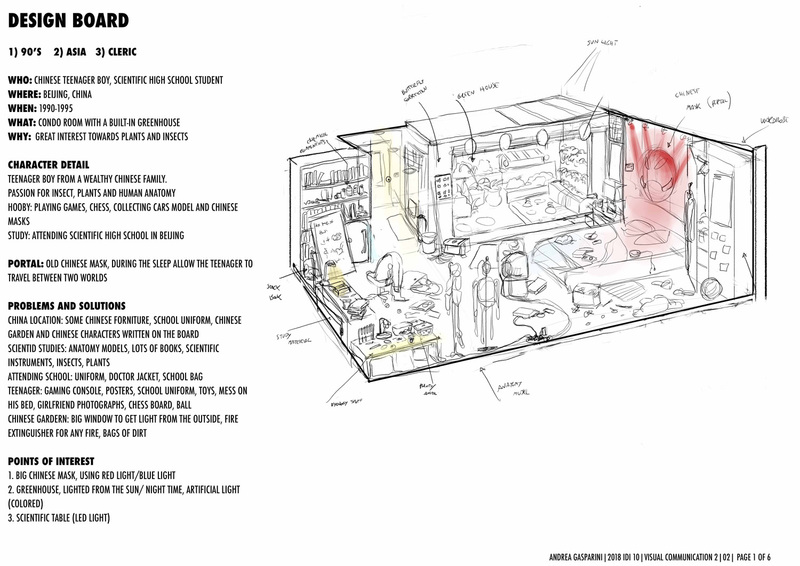 This project requires students to design two separate rooms at ¾ view. 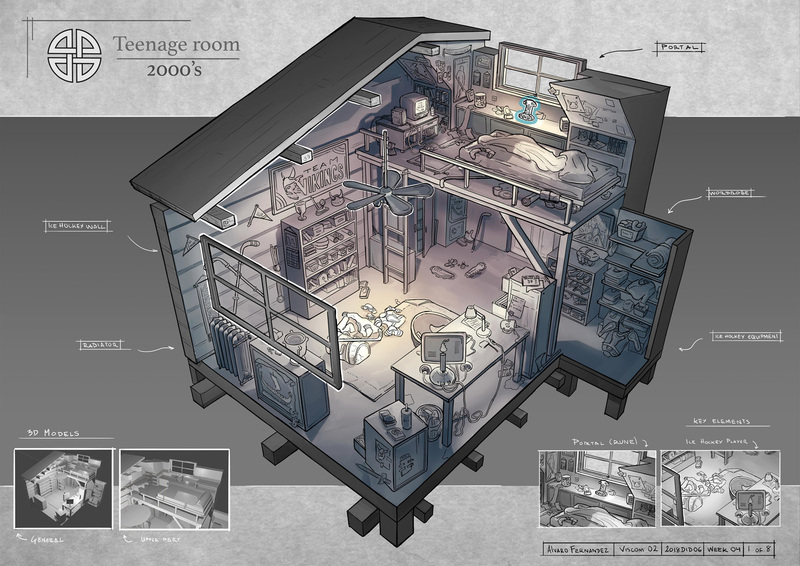 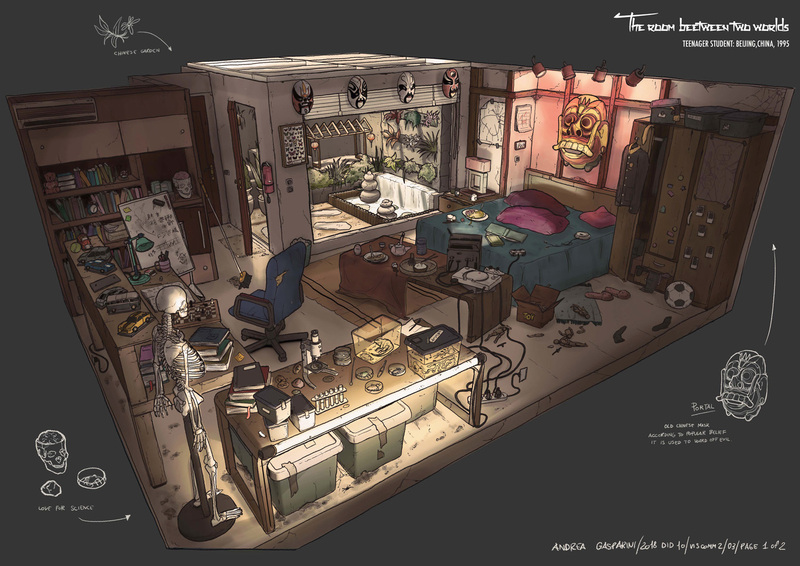 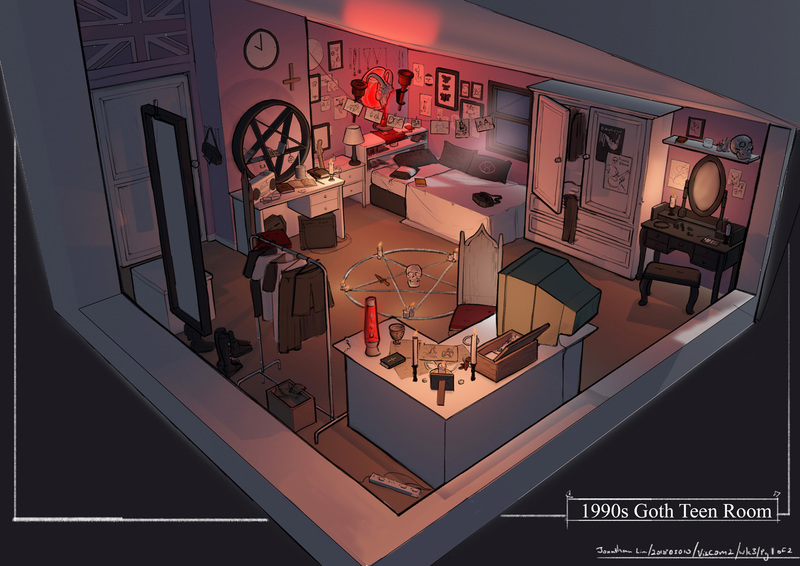 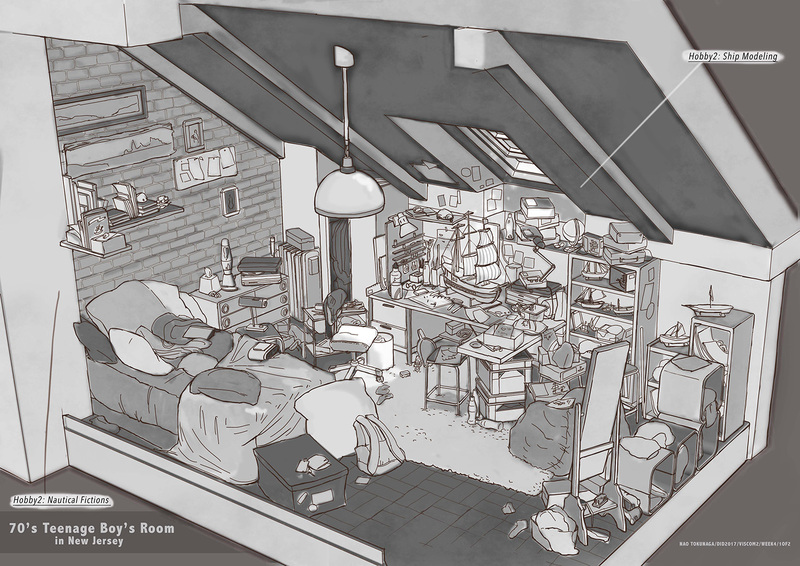 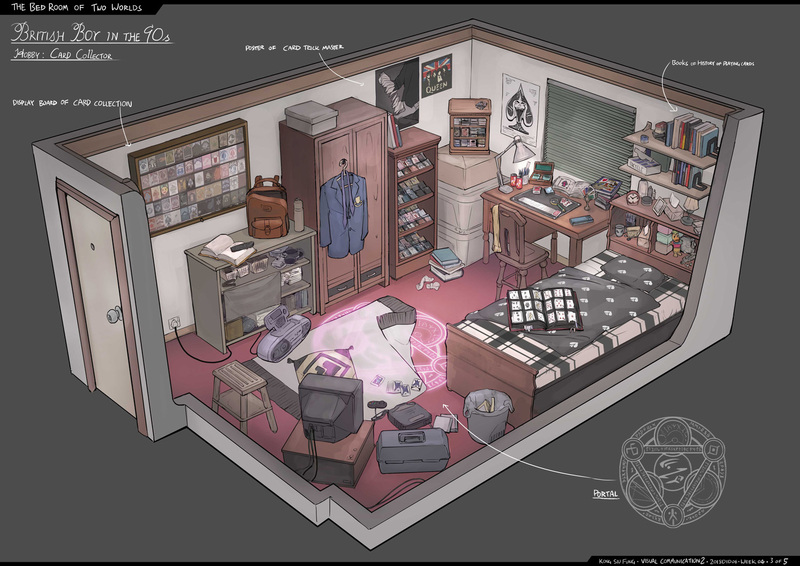 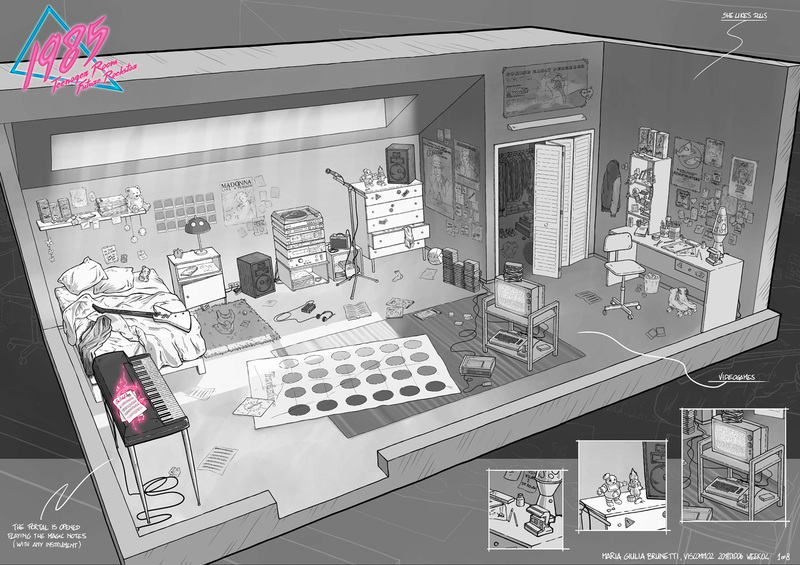 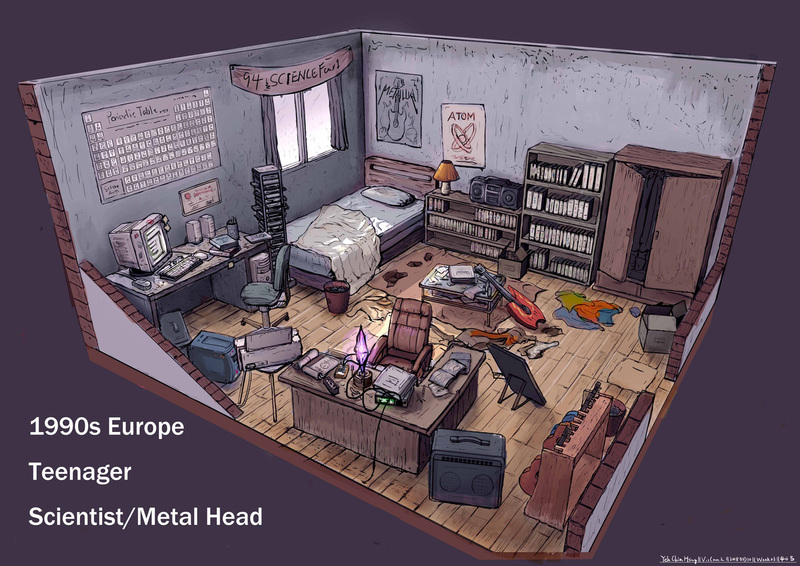 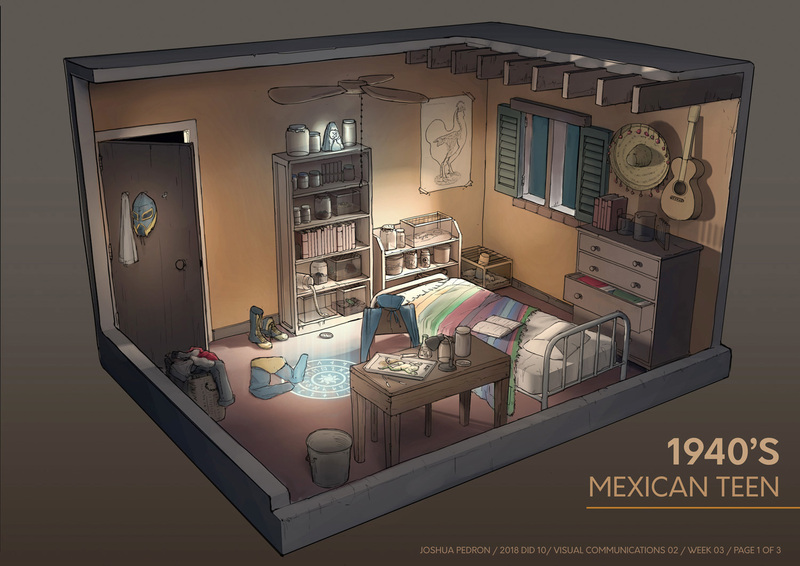 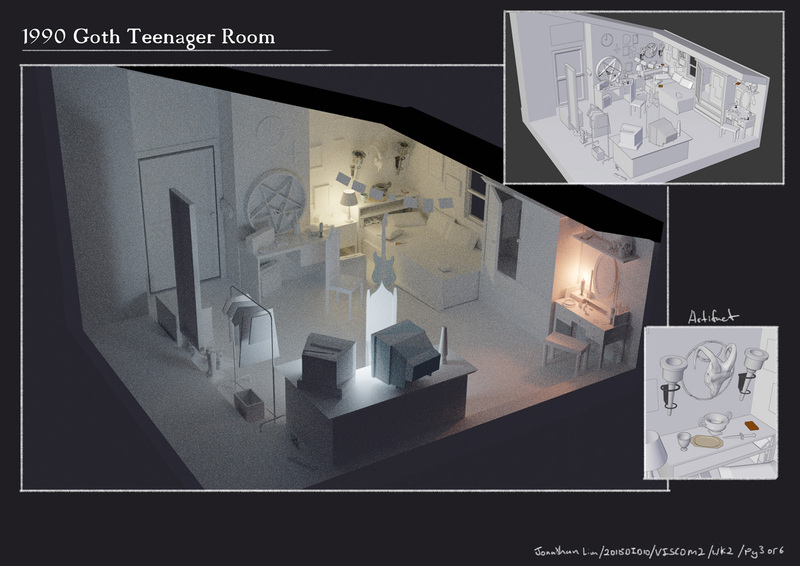 The first room is meant for a teenager living in the real world. 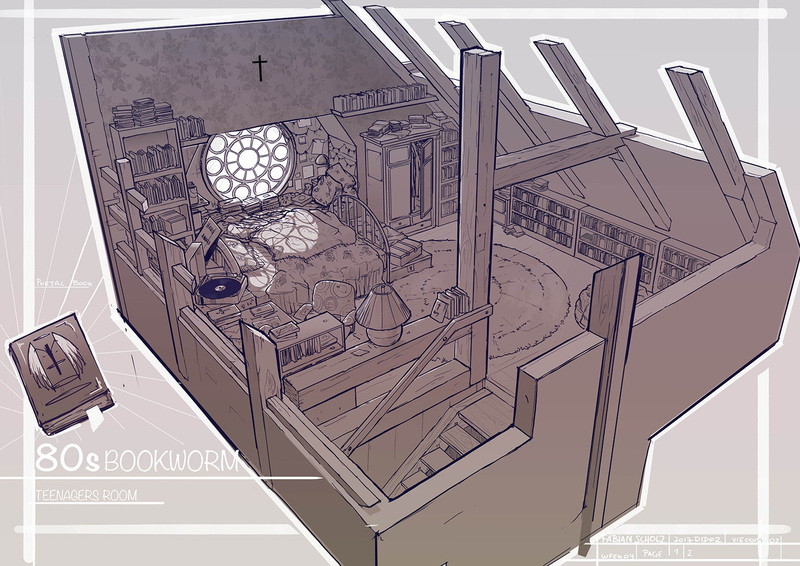 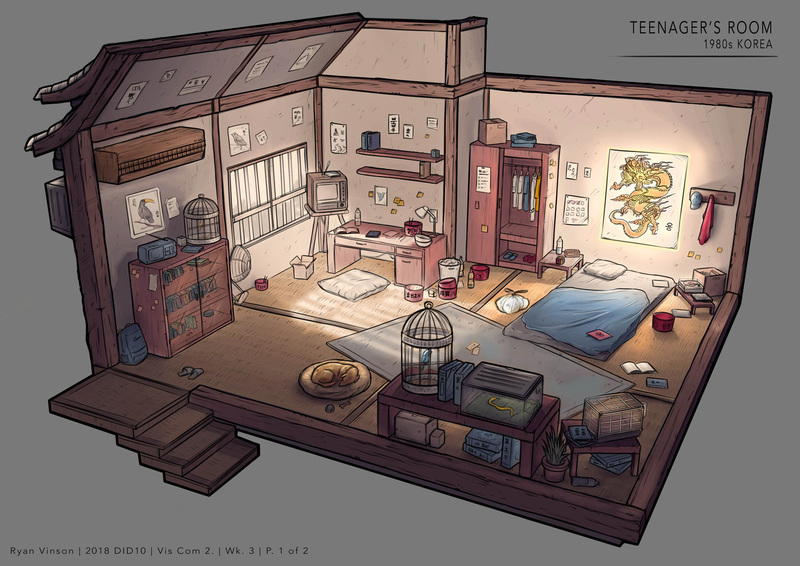 The second room takes place in a fantasy world, where the same teenager can live their alternate life as a dragon hunter, thief, assassin, etc. 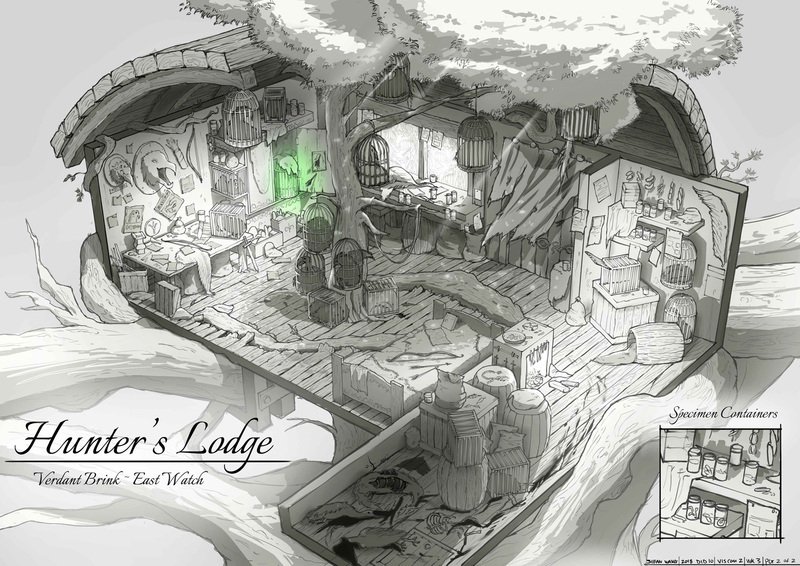 A secret portal in the rooms connects the two worlds. 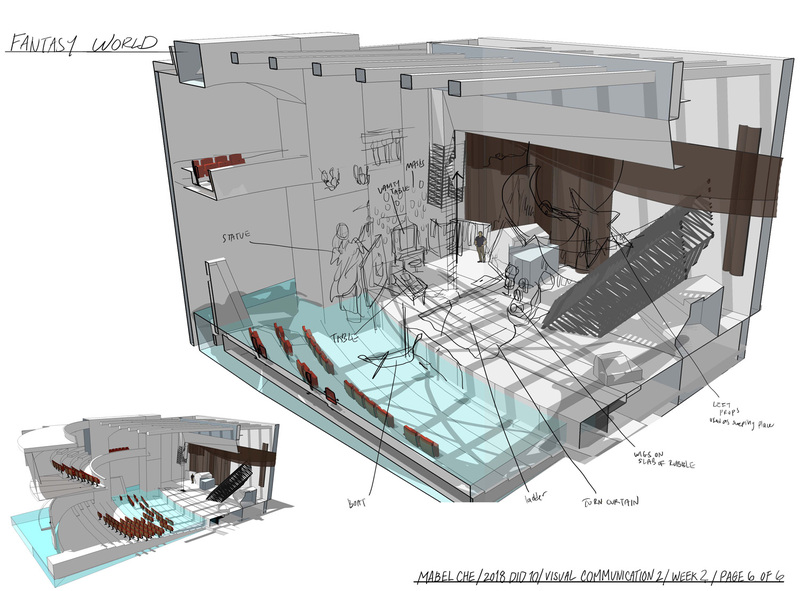 The aim of this project is to visually communicate the function of each room purely by visuals. 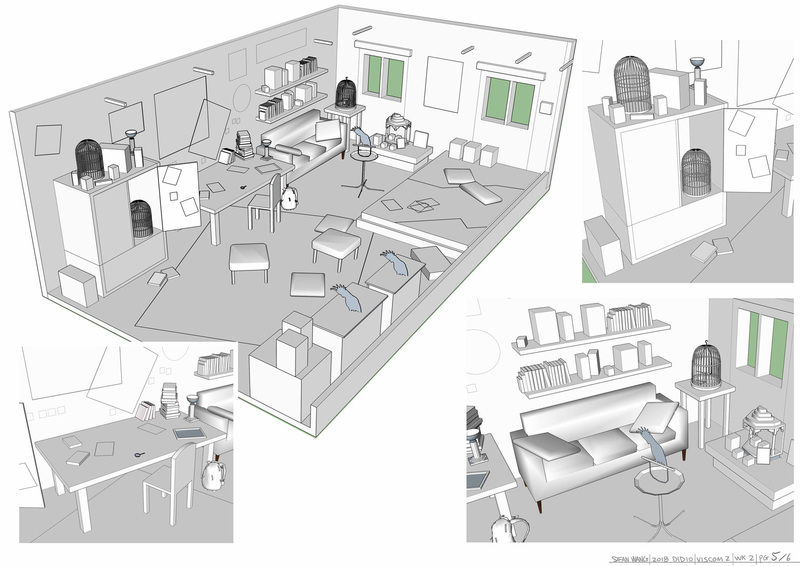 This requires students to carry out reference gathering, compile notes, sketch out ideas, build mockups in 3d and finally render the final presentation. 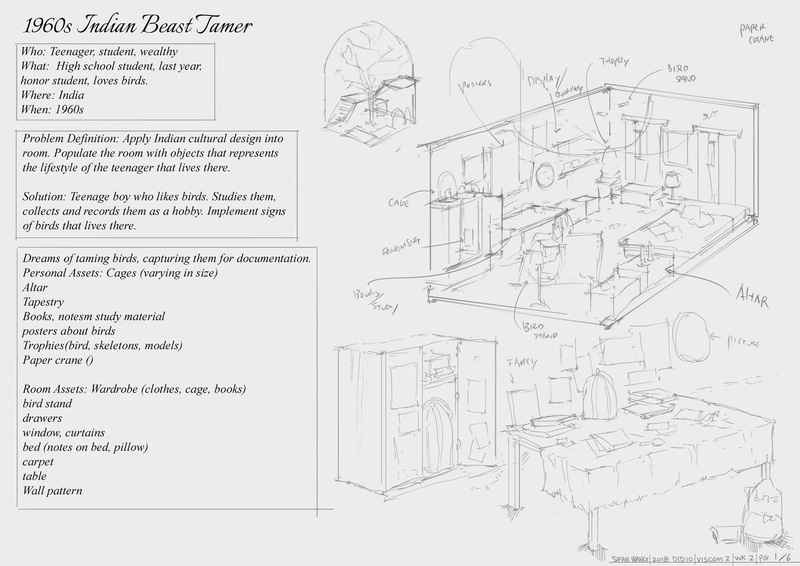 Class assignments such as these are a great way for students to learn about the design challenges they’ll be facing in the real world. 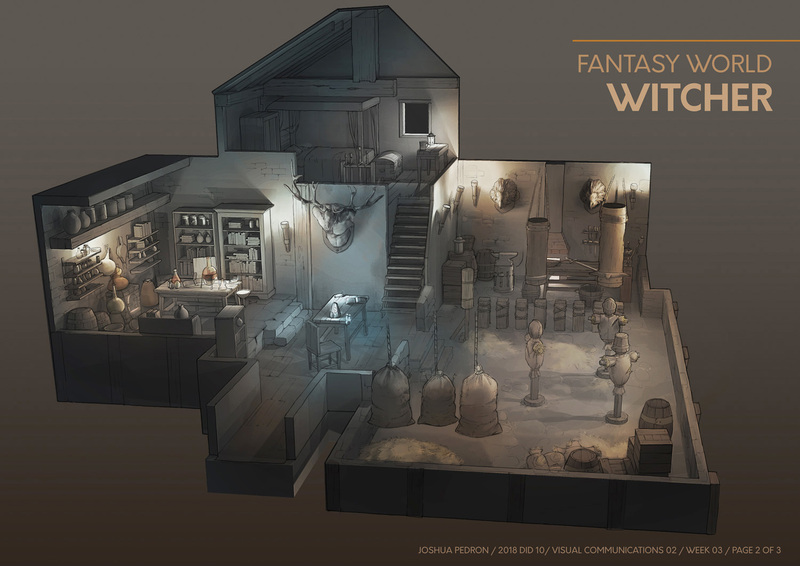 Most games and films are grounded in reality with a nice balance of fantasy. 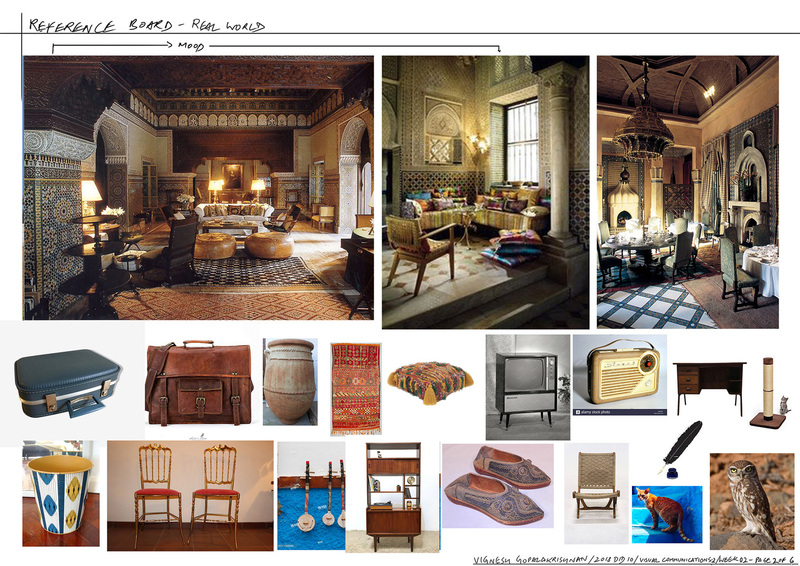 If you are learning from home, give this project a try. 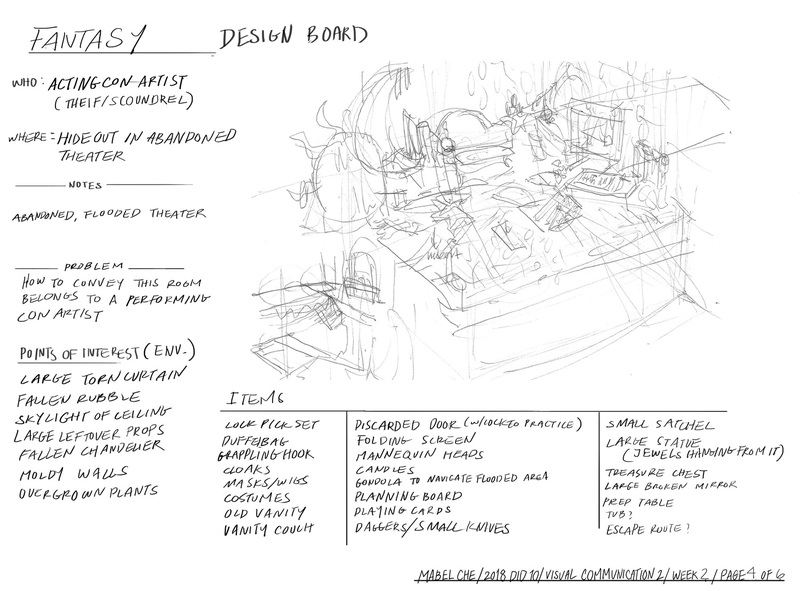 Below are the specs and steps. 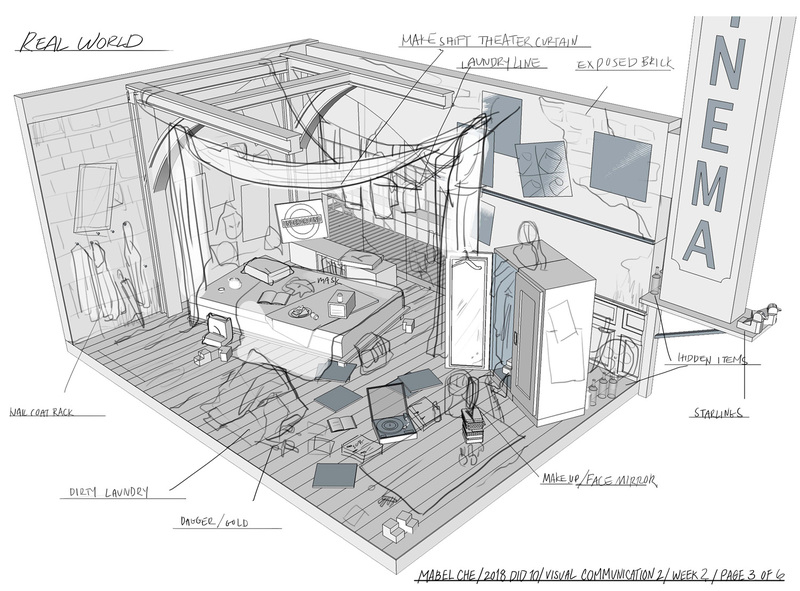 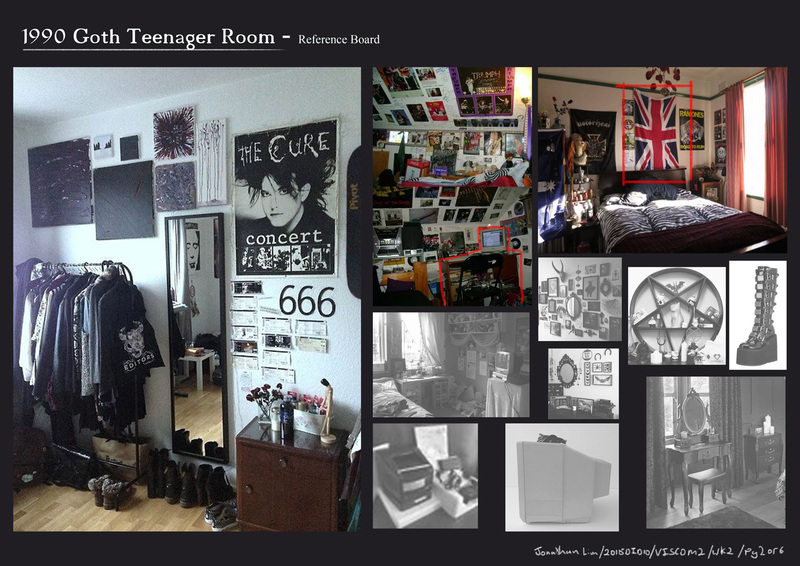 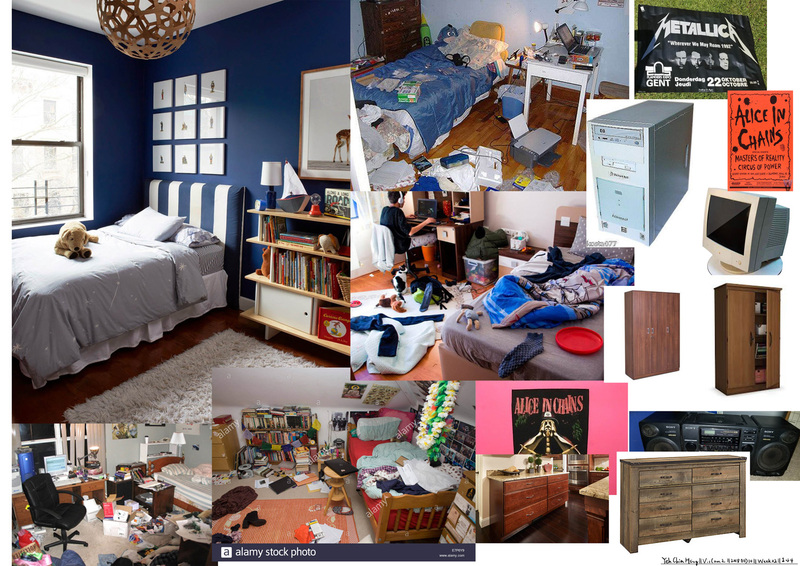 - Design a teenager’s room. 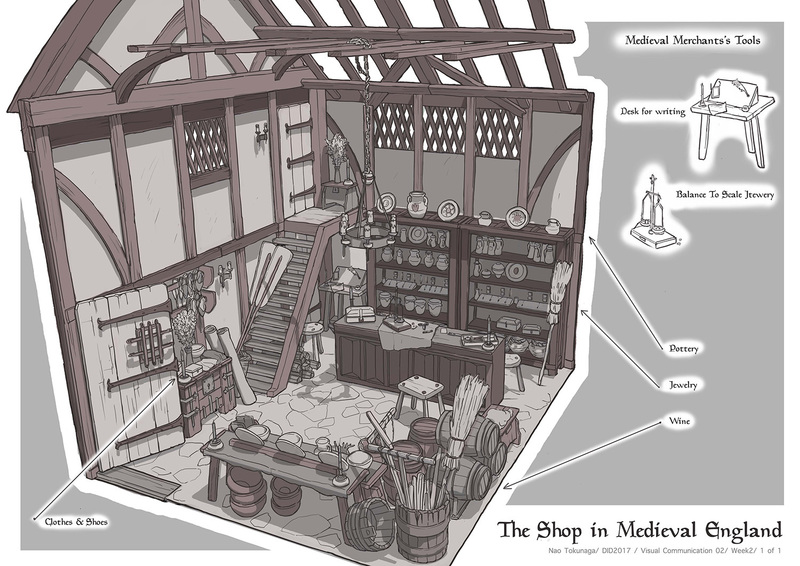 Time period and location are your choice (or can be dice rolled). 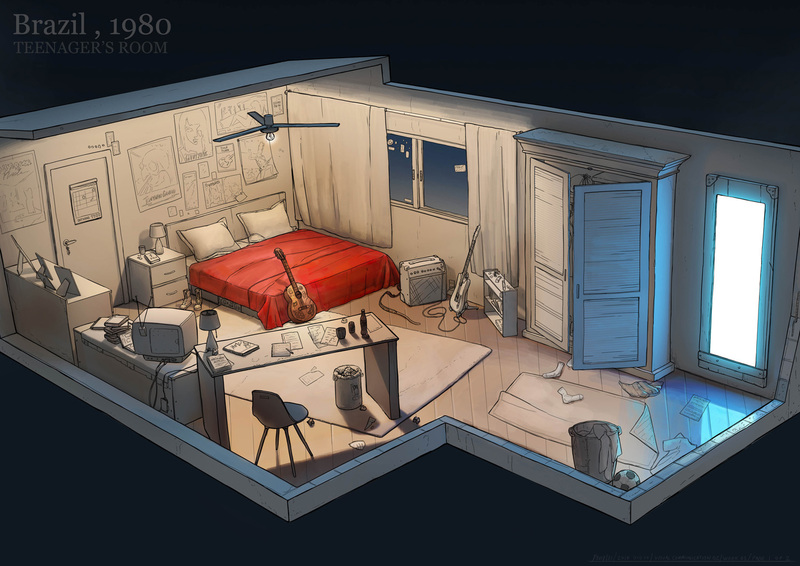 However, the room must exist in the real world. 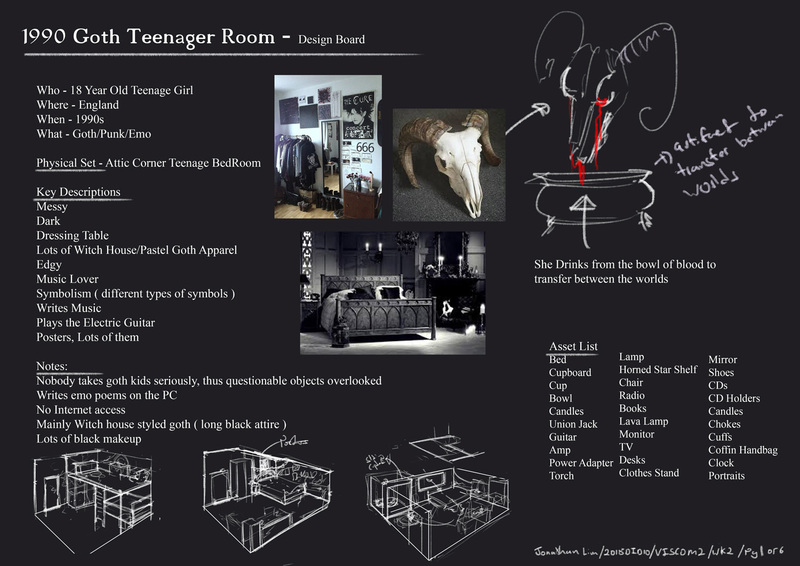 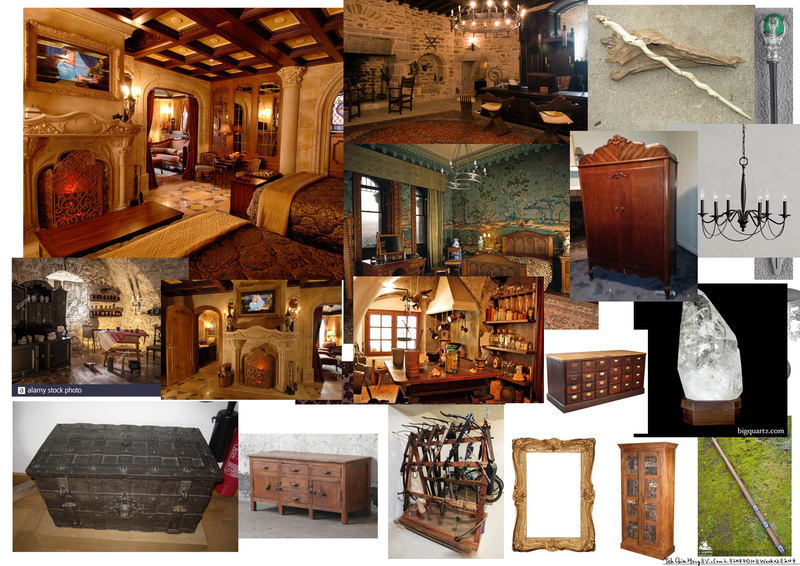 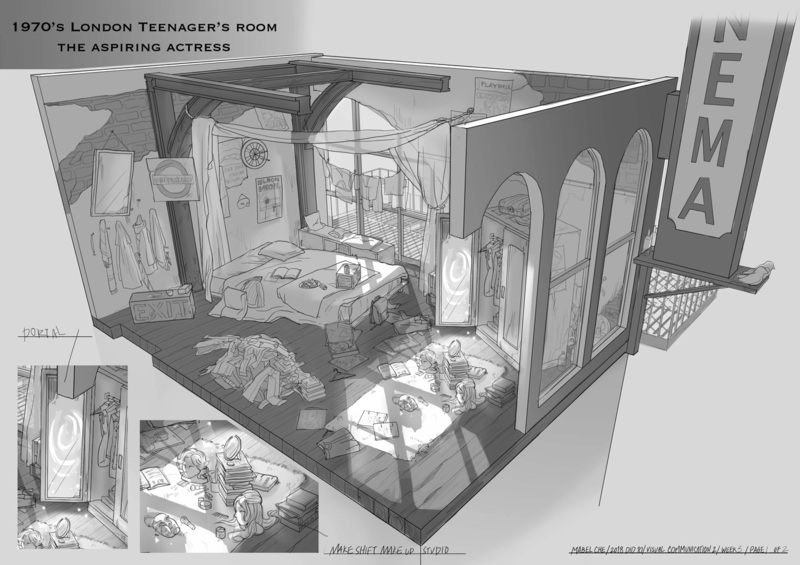 Use set dressing to communicate the teenager’s hobbies and how they are associated with the fantasy room. 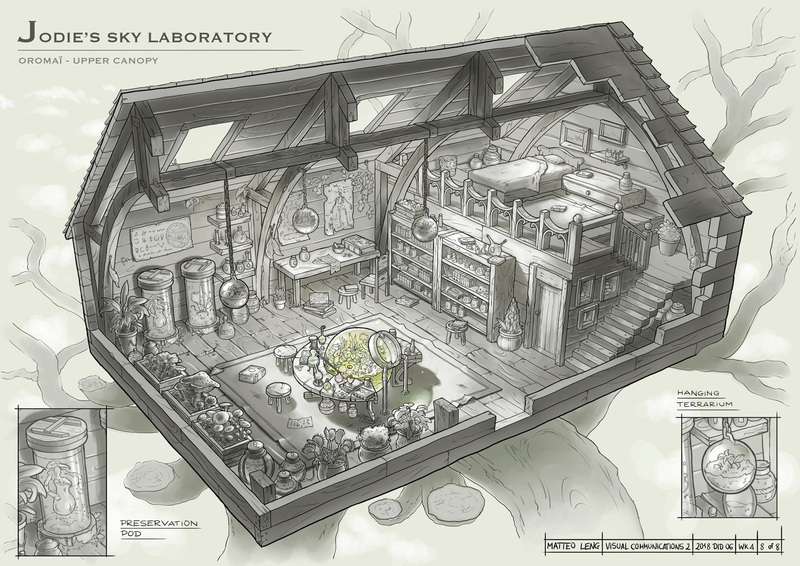 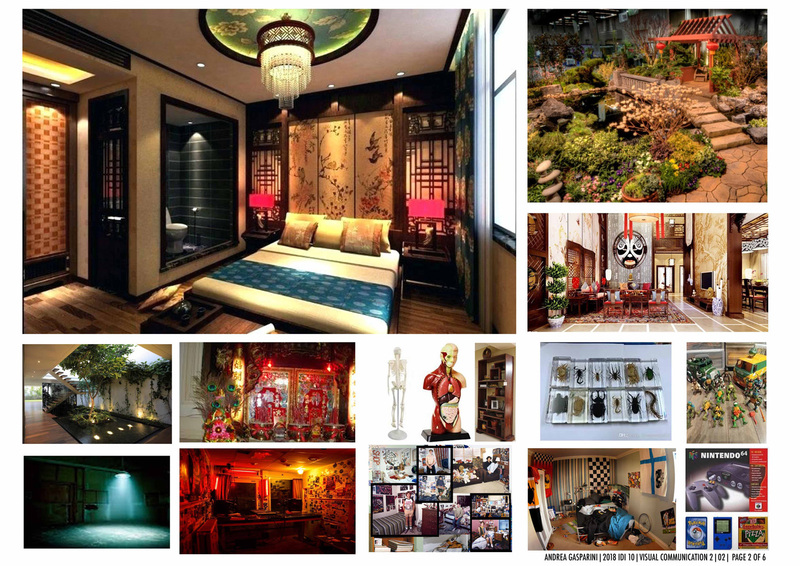 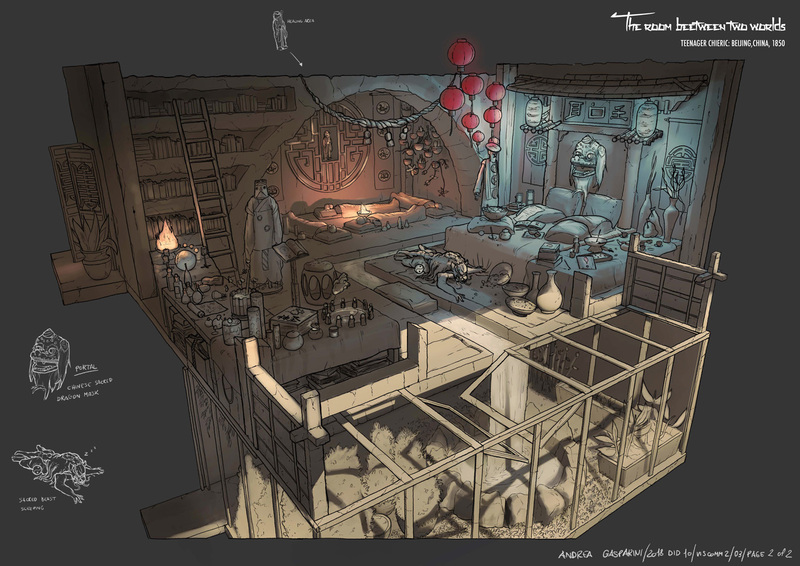 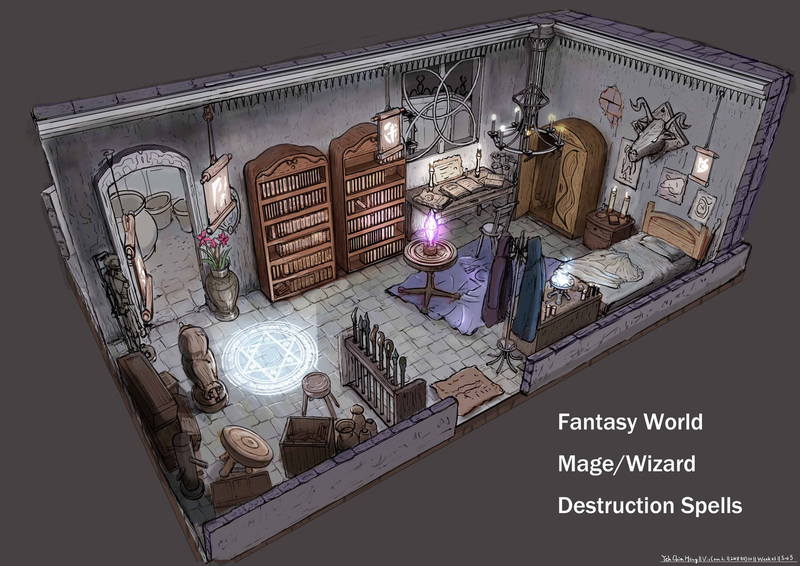 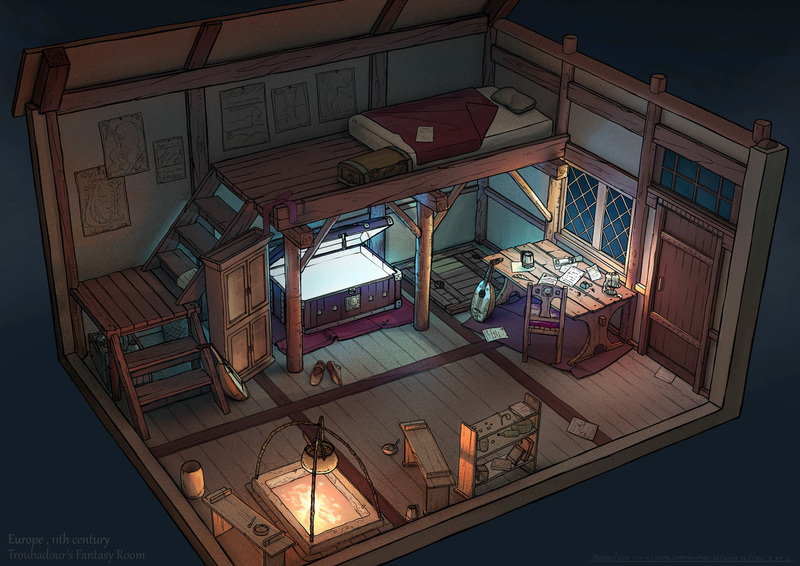 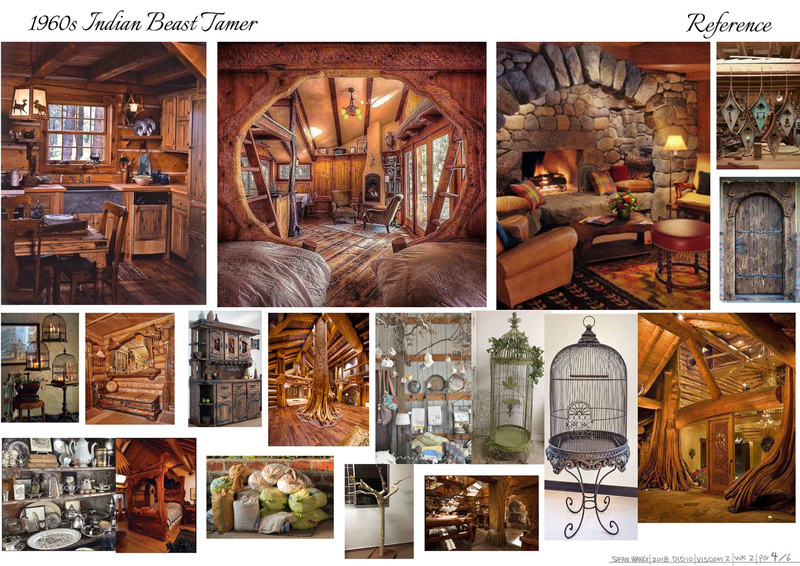 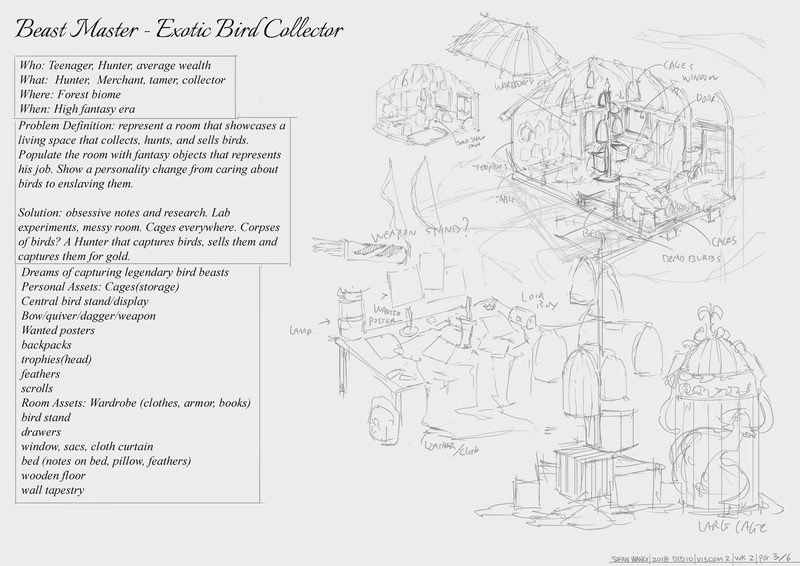 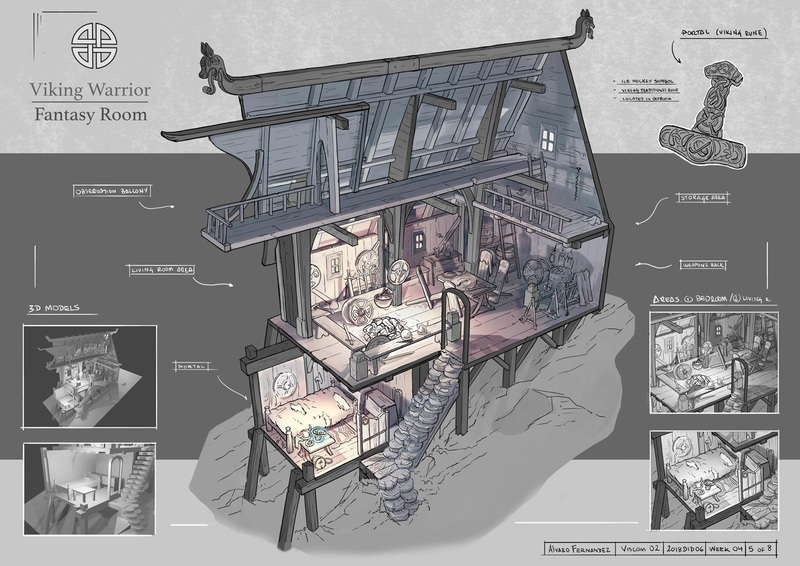 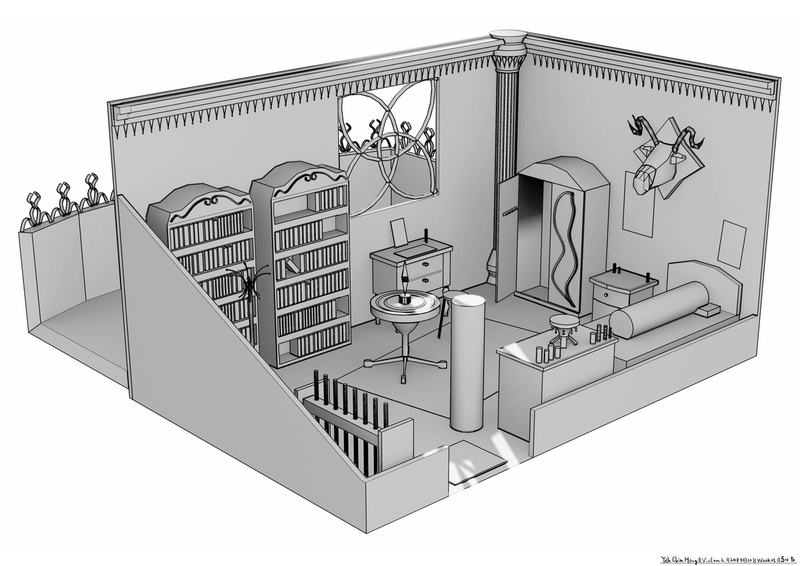 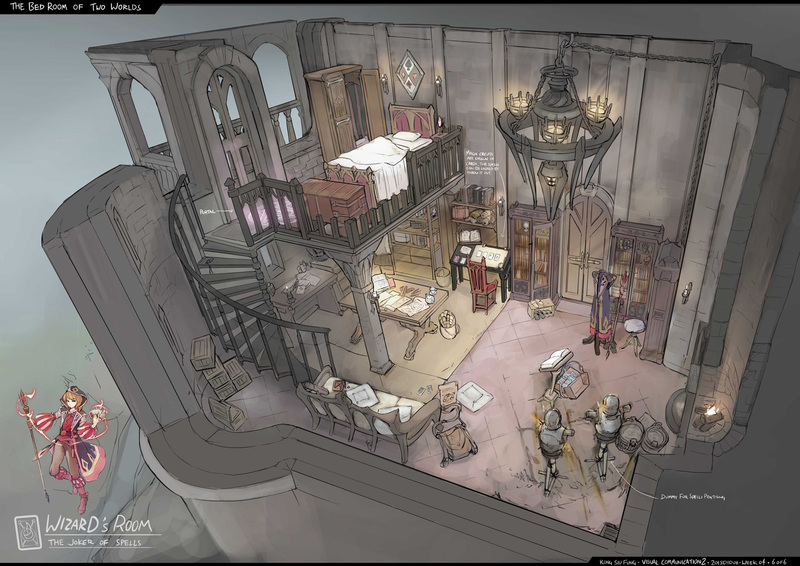 - Design a fantasy room. 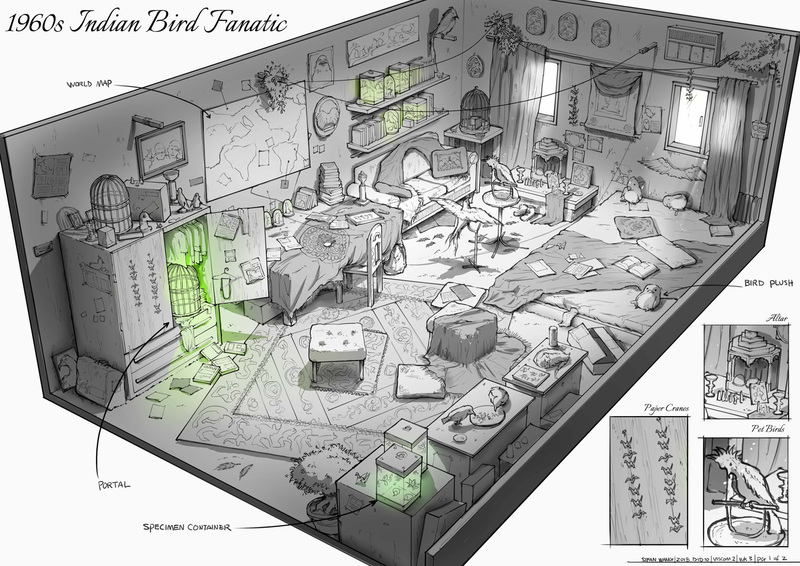 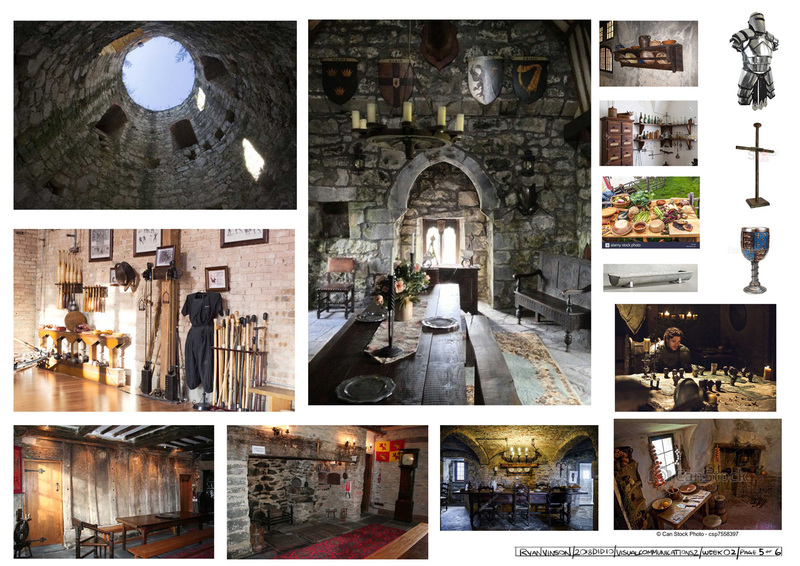 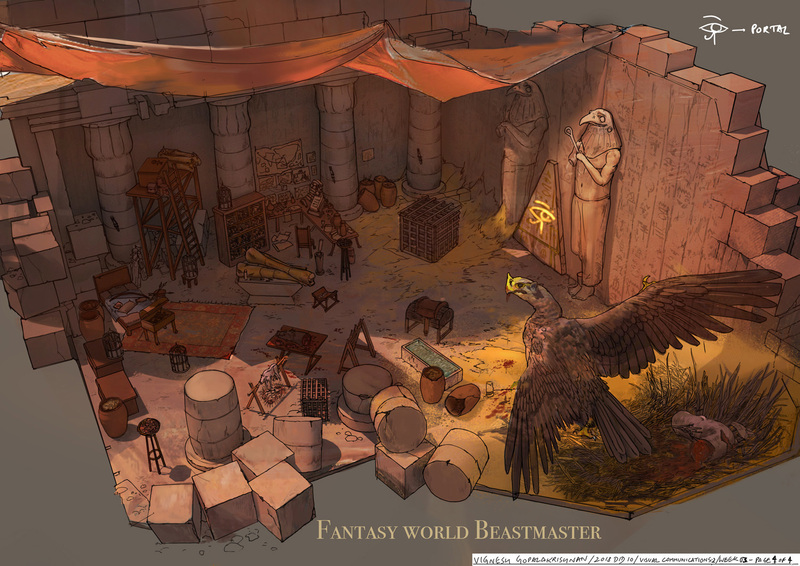 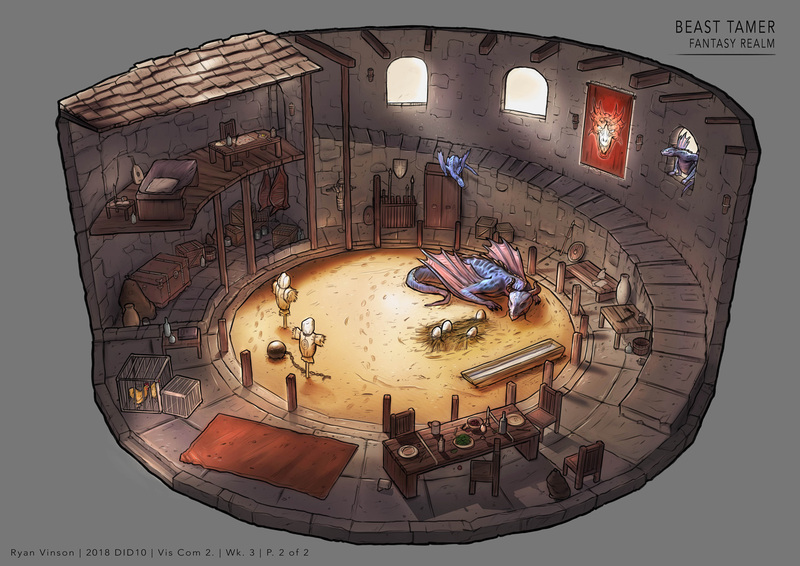 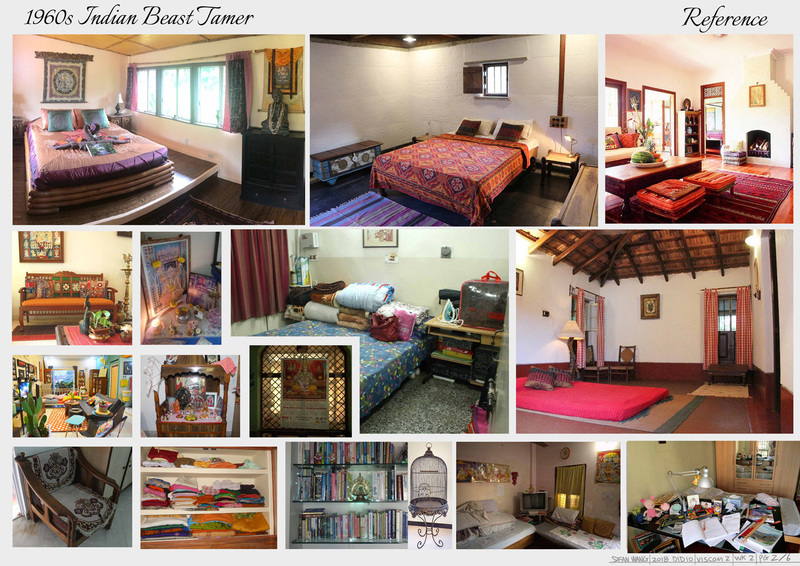 The function of the room is purely your choice (such as dragon hunter, jewel thief, beast master, etc.). 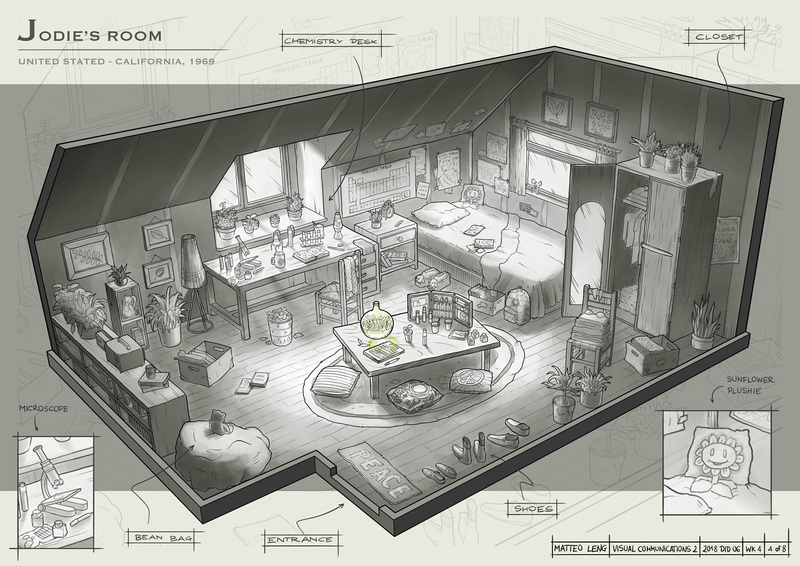 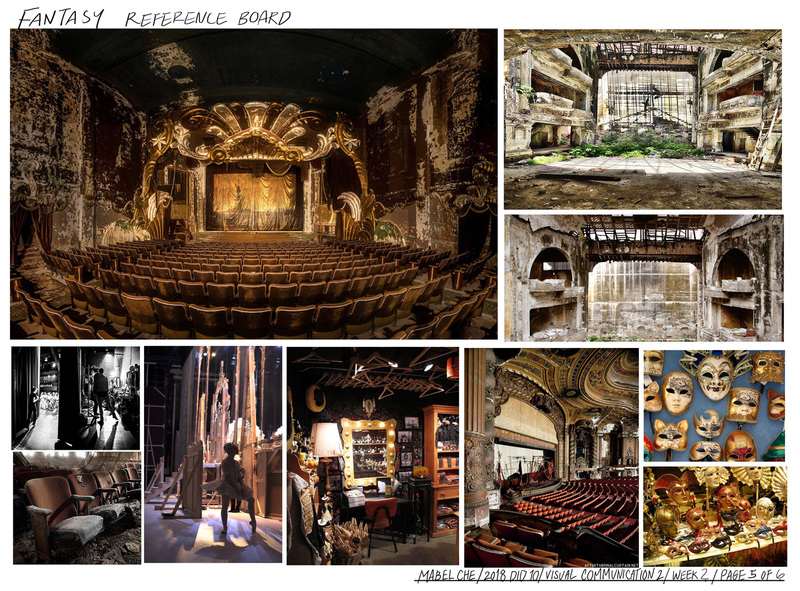 Use set dressing to visually tell the story. 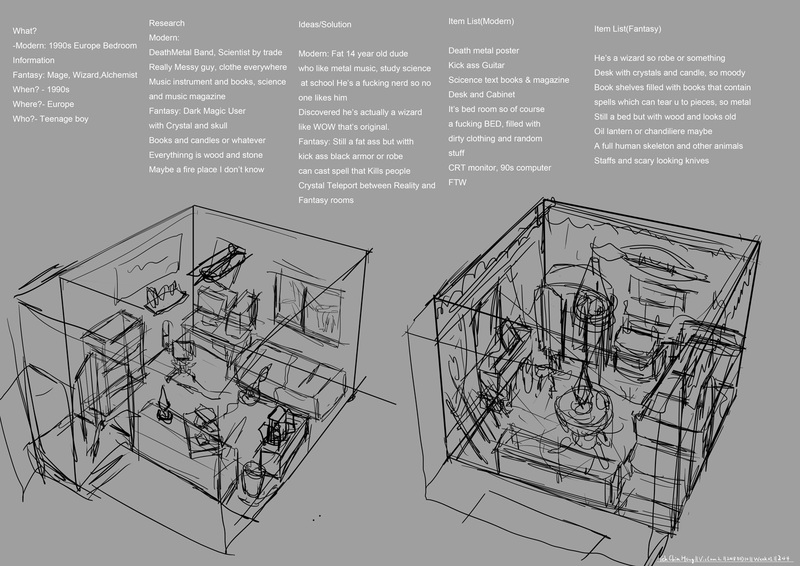 Gather lots of references for both rooms. 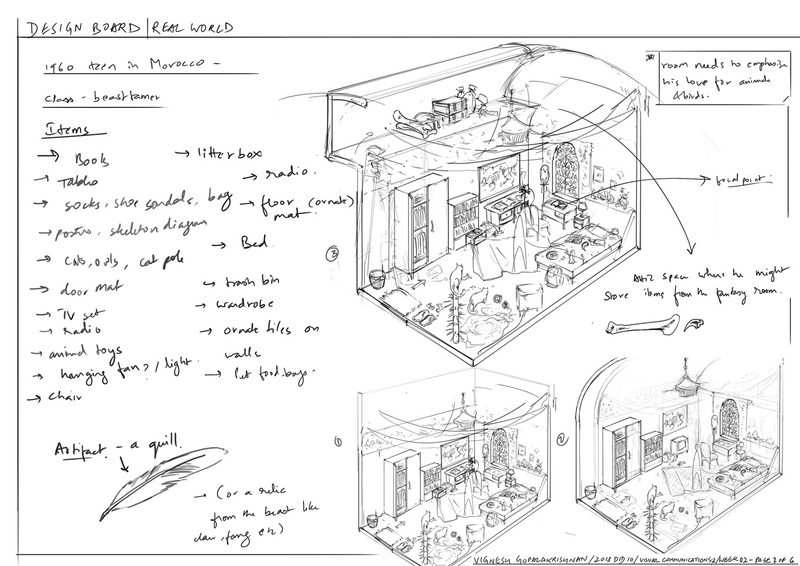 Figure out the big picture with notes and rough sketches. 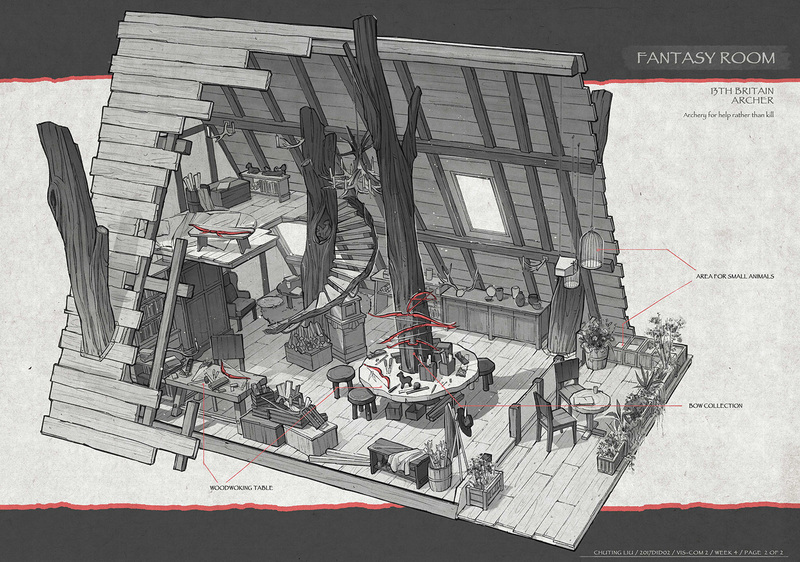 At this point, it’s all about thinking things through. 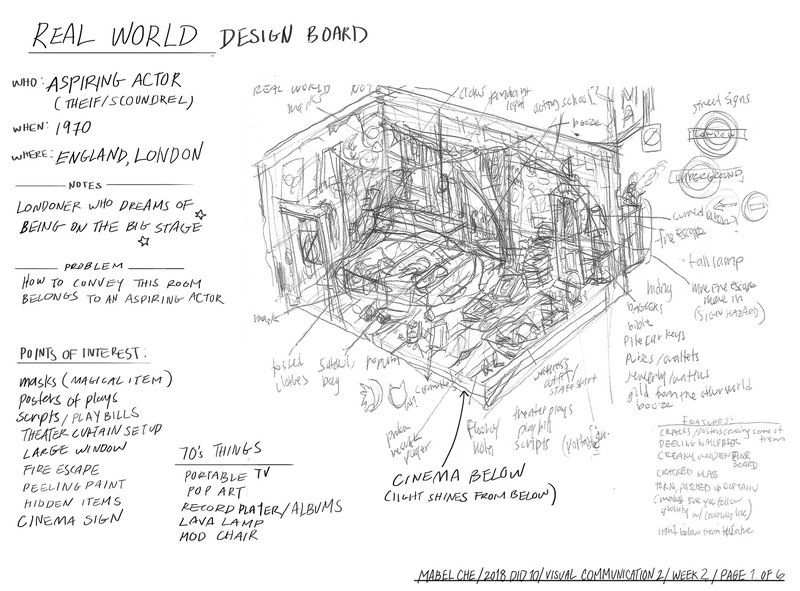 There are no need for fancy drawings and paintings at this stage. 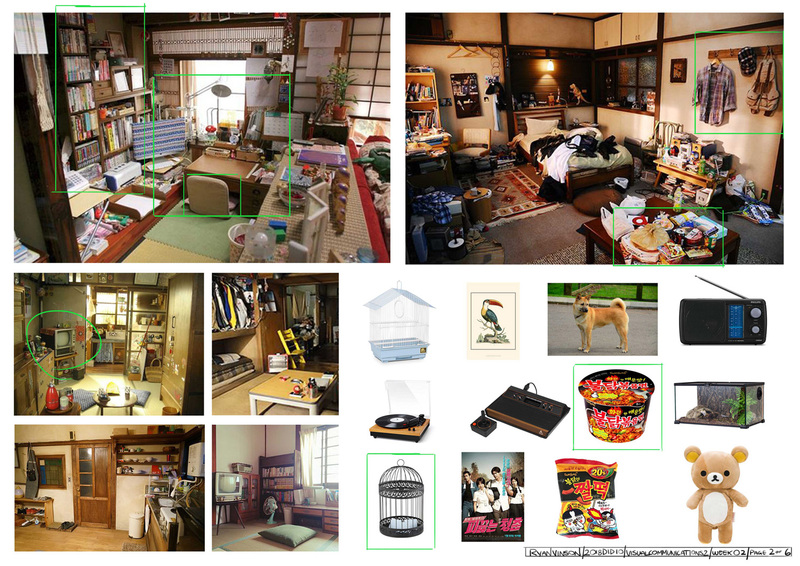 Keep everything loose but informative. 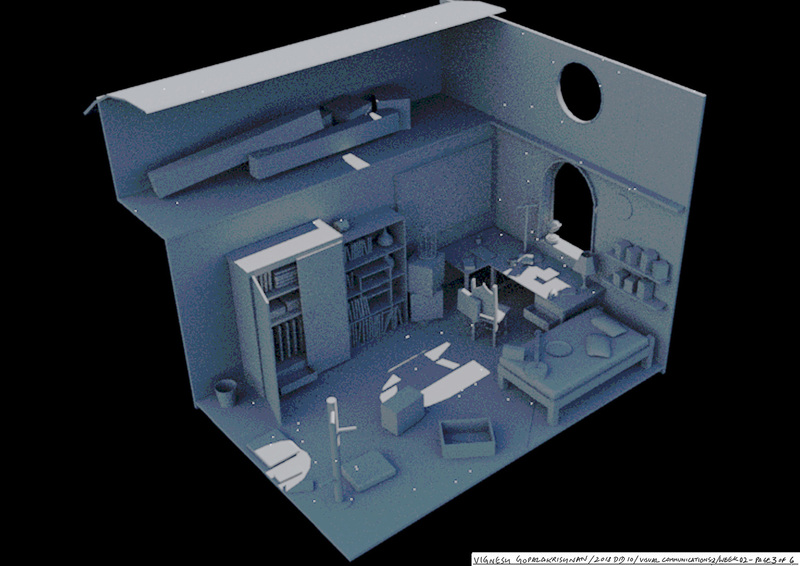 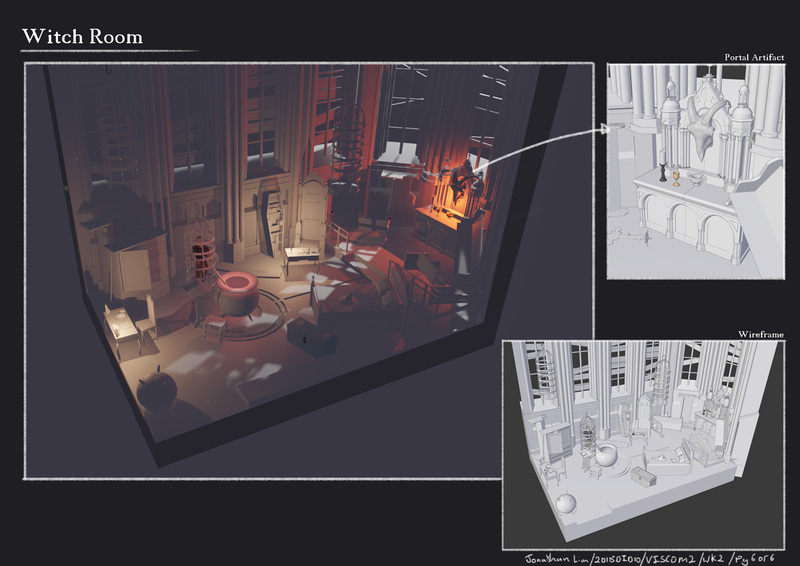 Use 3D software to mockup the basic rooms. 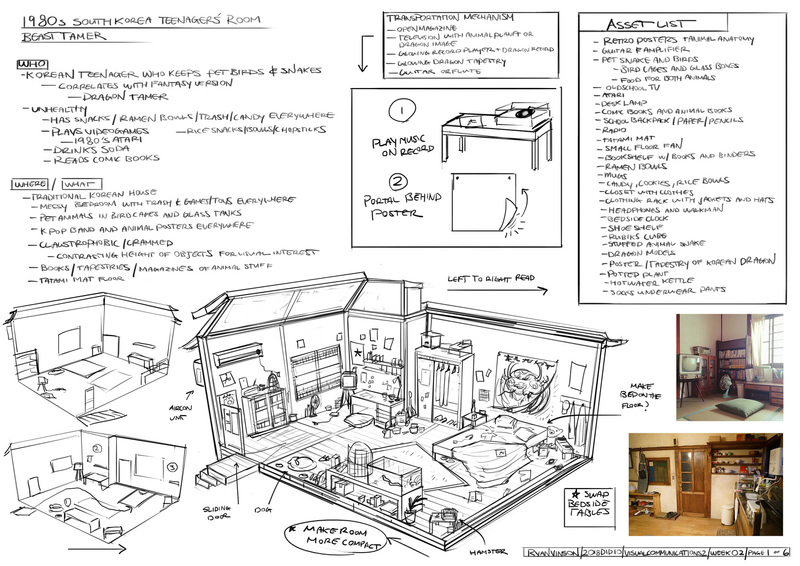 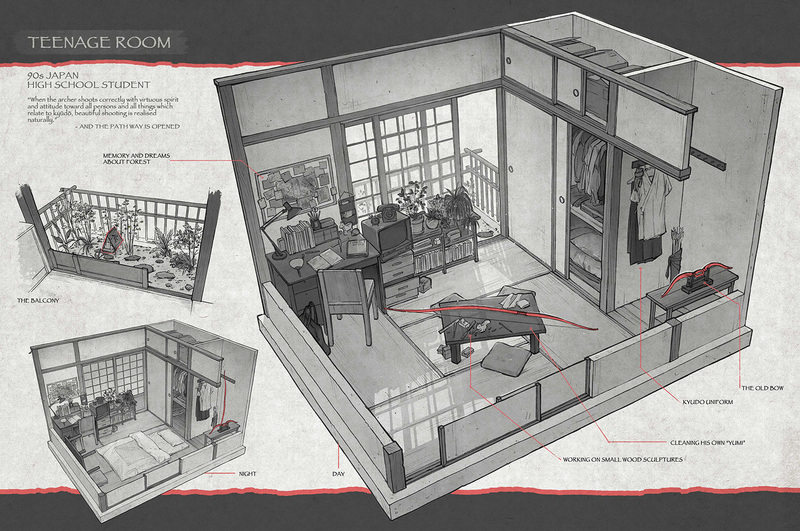 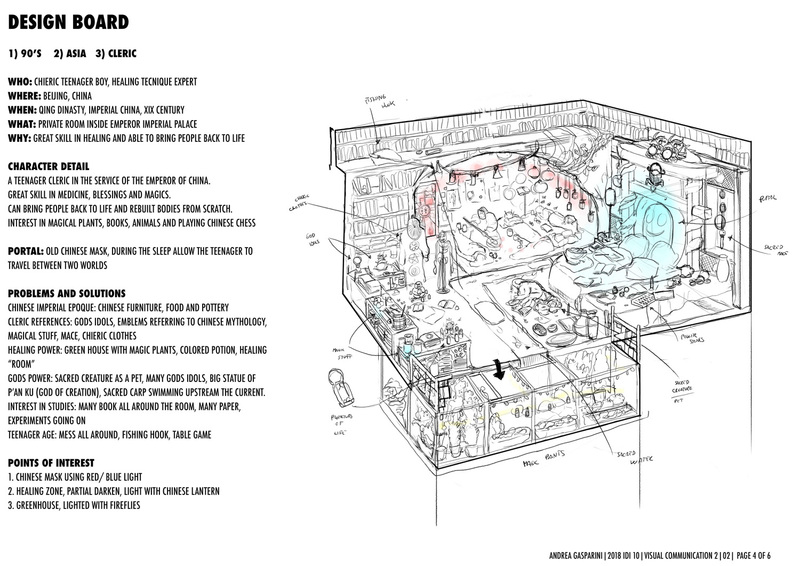 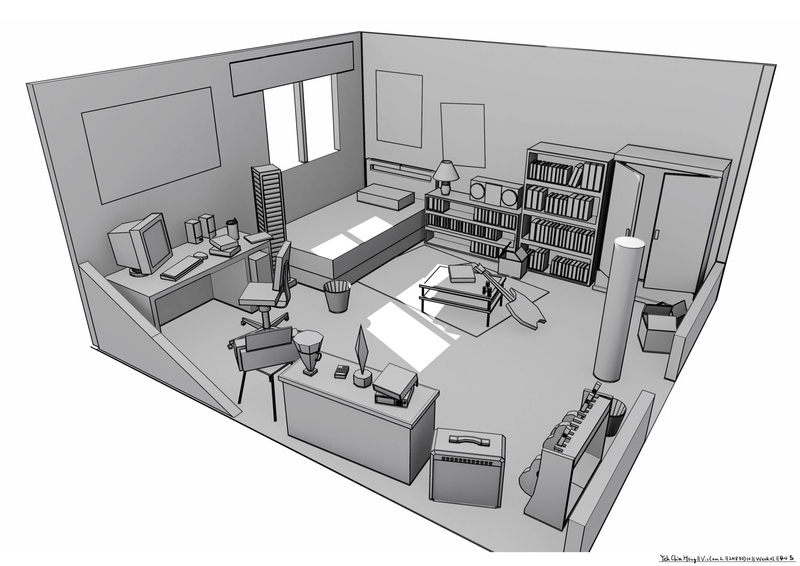 At FZD, we use SketchUp. 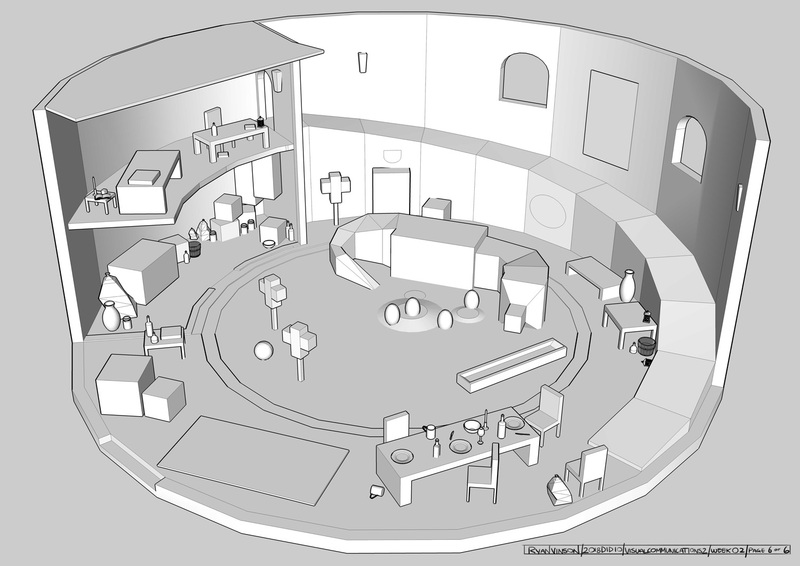 By using 3D, you can quickly play with the space and arrange objects easily. 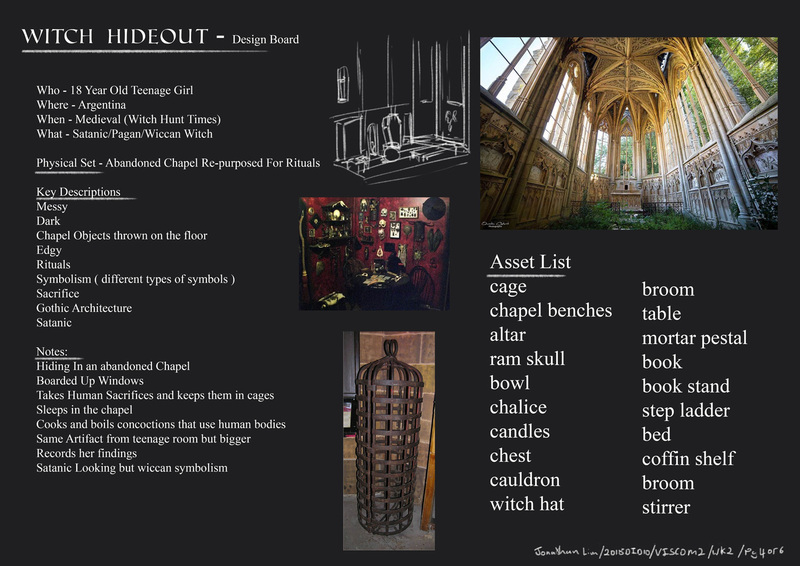 Refer to your notes and references constantly. 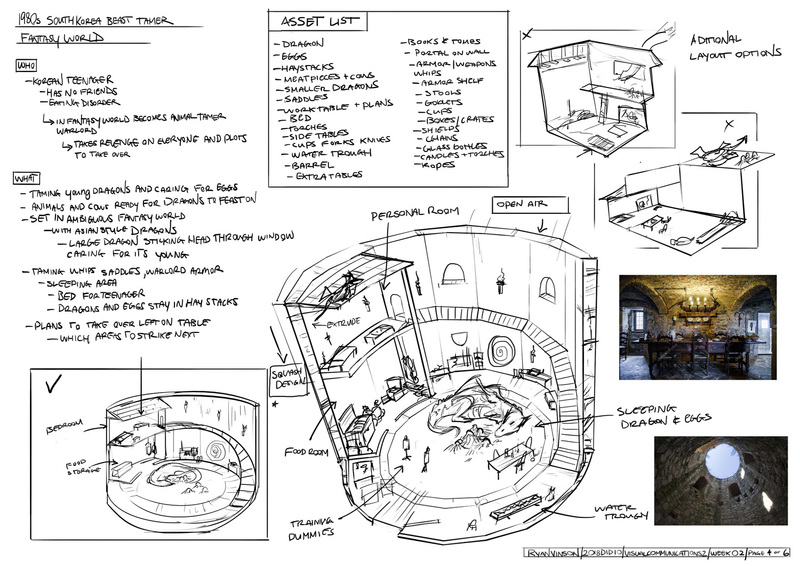 Without the need to hand plot perspectives, use your time on design and layout. 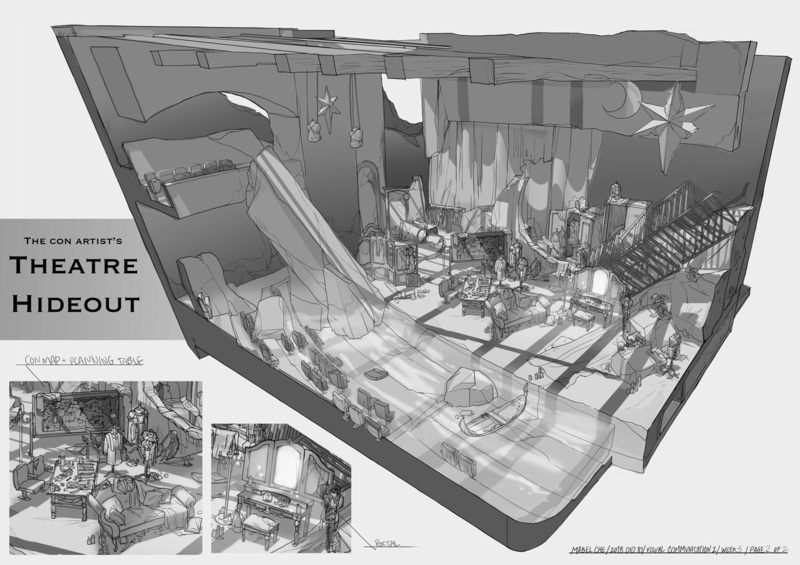 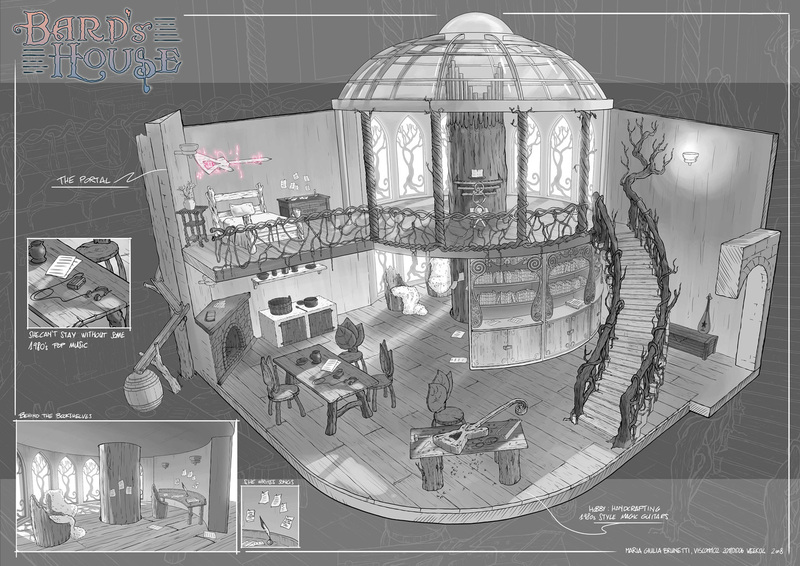 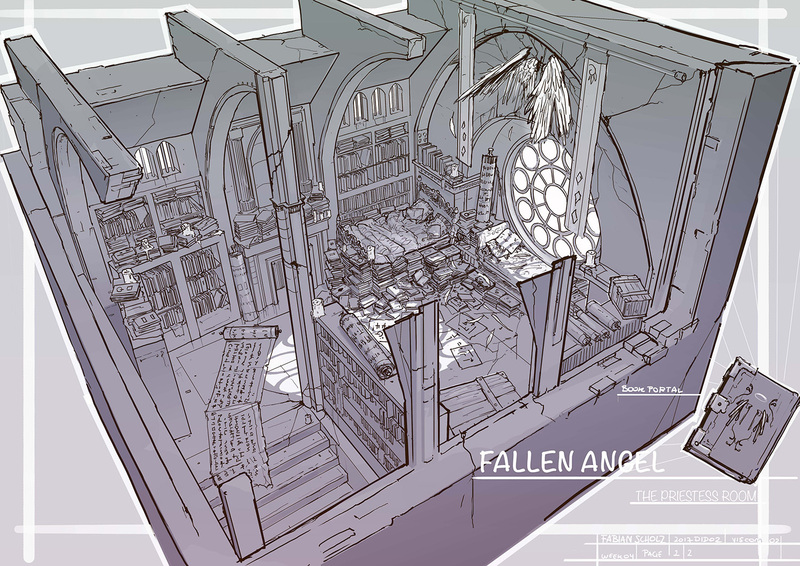 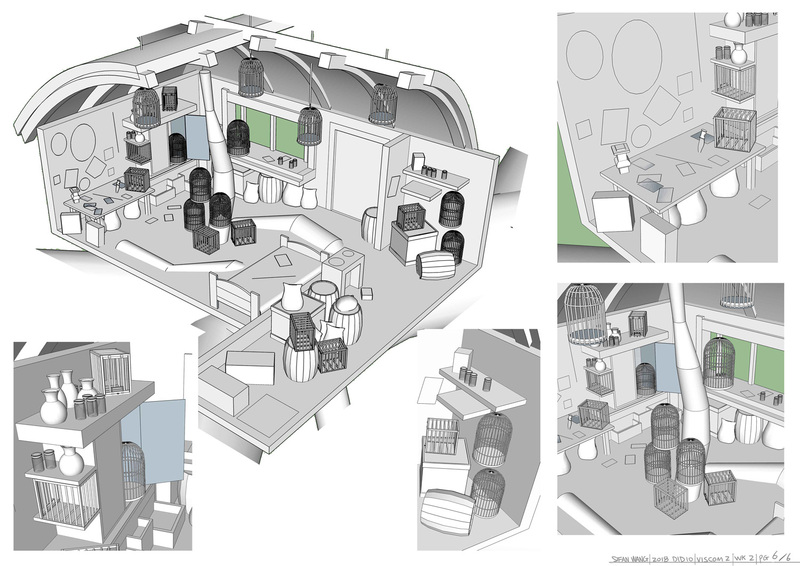 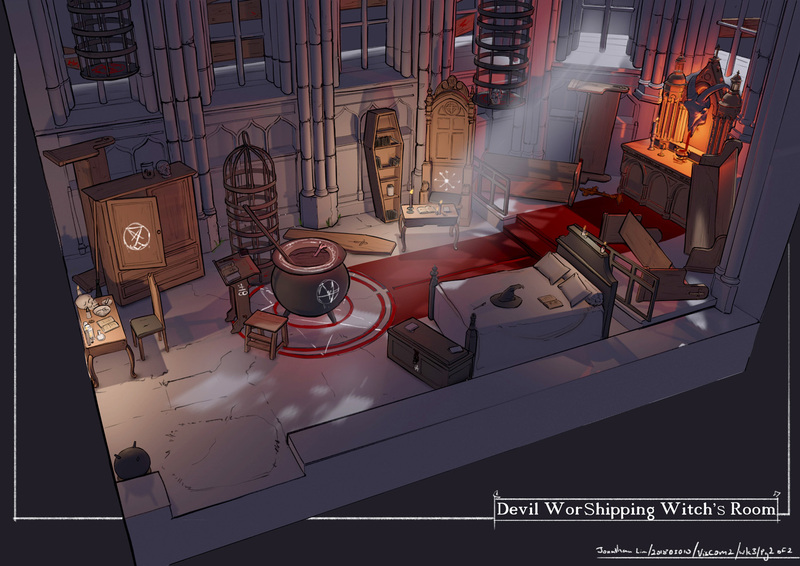 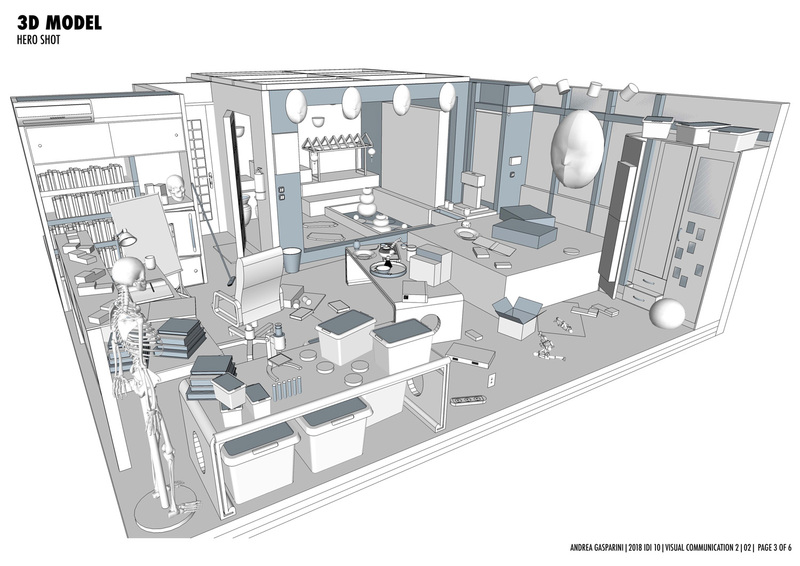 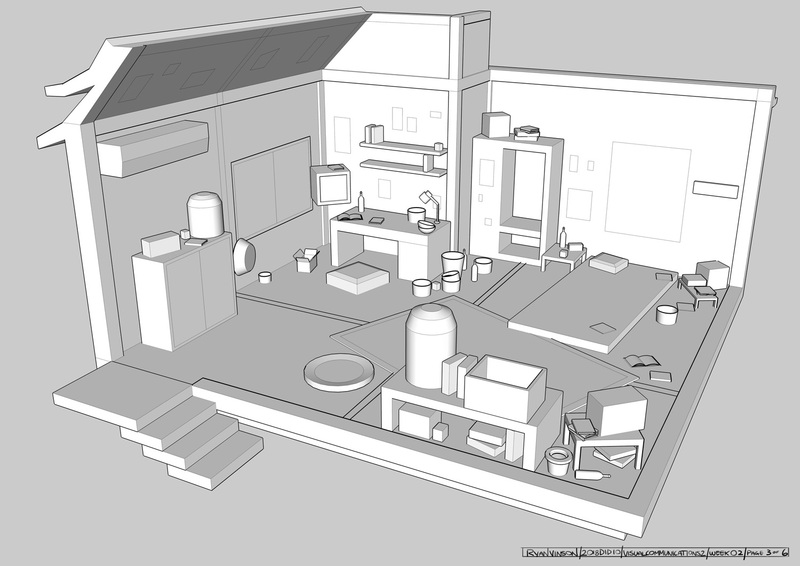 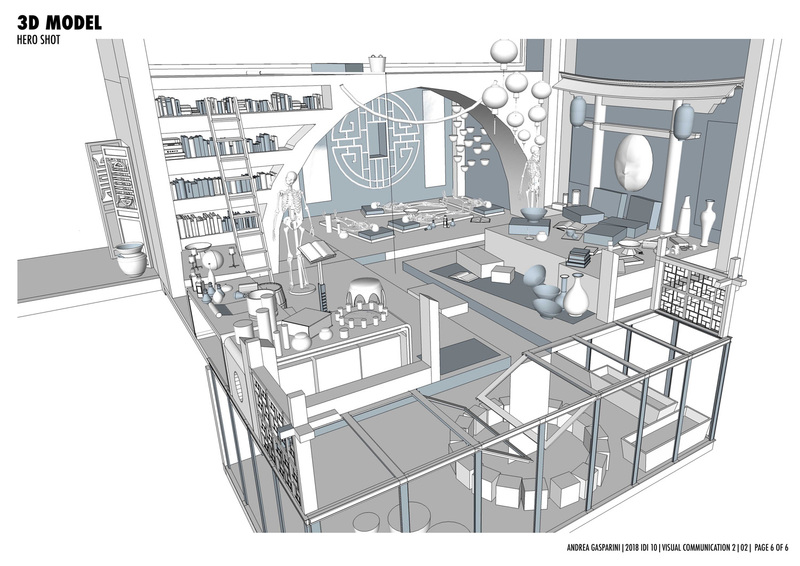 Sketch over the 3d model and add in line-weight and small details. 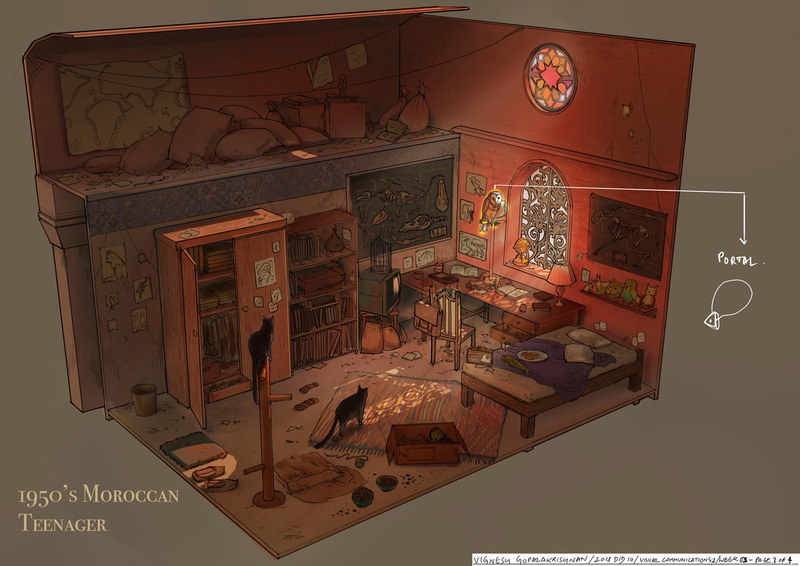 If possible, try to cast shadow and light onto the surfaces.